Make It Handmade: Board Meeting! It's that time again! Grab a snack, and let's chat about what we've done this October! I'd love to see what ya'll are up to-- feel free to chat on the facebook page, or leave a link in the comments below! This month has been a busy one for me! This is Make It Handmade's very first holiday season, and I had so many ideas! October sort of made me realize that I can't get to them all :(. Just as in real life, I'm picking and choosing the the projects that fit in with our family. This month we celebrated Navratri by making our own sewn, Dandiya Soft Toys. And phoned it in with some thrifty semi handmade Halloween costumes. To be honest, with potty training two toddlers, the start of the holiday season, and my daughter boycotting naptime (she has a sign and everything), I've been a little tired lately. So I've decided that in the coming months I'm going to indulge in a little selfish blogging! I'll still have a tip or tutorial on Wednesdays but you might hear a little more about what's rattling around in my head and see a few more pictures of the kids. I might even let down my hair and post on a Tuesday! We'll see how it goes. I'm joining my first challenge-- Rikka from Ricochet and Away has a "Ring Your Neck Challenge" . Each participant has to make a scarf. Her last challenge on fabric manipulation looked like so much fun, so I thought I'd crash the party this time. Any ideas on great scarf to make? And... (drum roll please!) 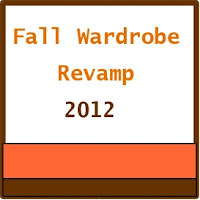 I'm also going to be posting a tutorial for Anshu's (from Blooms and Bug's) Fall Wardrobe Revamp Series. I've been a fan of Anshu's for what seems like forever. She has a bunch of cute little girl clothing tutorials that will make you want to drop everything and run to your sewing machine! I'd love to hear what you are up to, and what your plans are for November. Feel free to post on the Make It Handmade Facebook page or leave a link in the comments. So tell me-- how have you all been dealing with the holiday stress? Or has it not hit you yet? And... um... any ideas on potty training? Hey Palak! Thanks for the shout out to Blooms And Bugs!